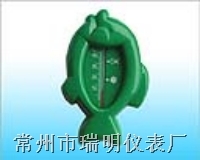 Floating Fish Bath Thermometers always test the water before bathing your child. Our bath thermometer makes it really easy. The underwater thermometer indicates the ideal range for baby's bath water and measures the temperature within that range. It is also a great float toy. Bath Thermometer is fit for children when they swab down.Clear temperature indication with red or blue organic liquid, which shows the best temperature of the bath water for children. Lovely fish type delights children when they bath. The thermomometer indicates temperature over the range of +10 to +40 degree C. The floating bath thermometer measures 155mm x 60mm and weighs less than 25 grams.